Lately I am just walking around or driving and suddenly I remember something I forgot to blog about. Like last night I was driving home and just as I hit Red Hill I realized I forgot yet again to blog about my thoughts on the super duper magnificent omg wonderful Lost finale. I am a bit torn as to which scene to post since there were four that I considered incredible, but I finally settled on the Goodbye Kiss. I found this fantastically amusing, but this is probably because I grew up in the floral industry on the Big Island, where wanting to die at the sight of anthuriums is very common. Hey, you try staying up til 2 am making tropical Costco bouquets in the freezing winds of Mountain View. My brother will get a chuckle out of that. My family has caved into the peer pressure and acquired a Wii, much to the delight of Buddy, who thought Wii Boxing was awesome. We had to start keeping the wiimote on top of the tv where he can’t reach it after he was sighted hammerfisting the nunchuck and wiimote into the hallway walls. He’s such a hallway bully. If you were going about your business a few nights ago and suddenly heard a high pitched screech, that was probably me. I’m sitting in the living room when I hear, “Um, should he have that?” I look up and Buddy has opened my bento accessories drawer and somehow taken out my cottage cheese tub of precious soy sauce bottles. My immediate reaction was to yell, “BUDDY, NO!” and it was as if I’d set off some alarm in his head that any mischief to be done had to be done immediately or not at all. He thrust his grubby little toddler paw into the tub and began to flurry his fingers around like a cake mixer gone psycho. Piggies and fishies and pandas and flowers and carrots went flying in every direction. 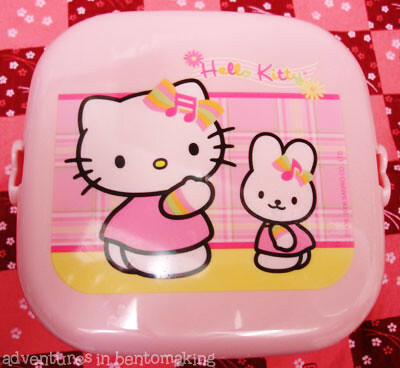 Okay, so… my bento contest. I hadn’t said what I was giving away, but now I have a picture so you can all scramble to enter! 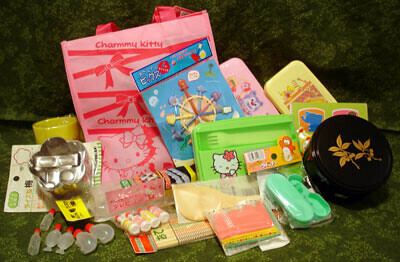 Oh yes, this bento prize pack is totally filled with awesome sauce! If this doesn’t inspire you to submit an entry, you need your head examined. 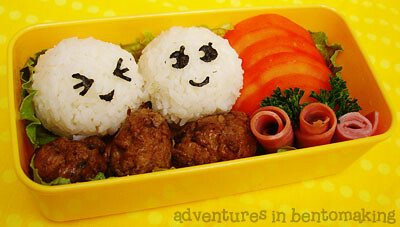 I mean this in a good, concerned fellow bento fan way. 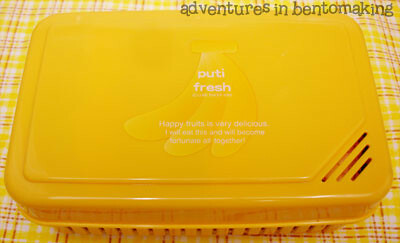 To find out how to enter, see my 100k Bento Contest post. Click for big version! 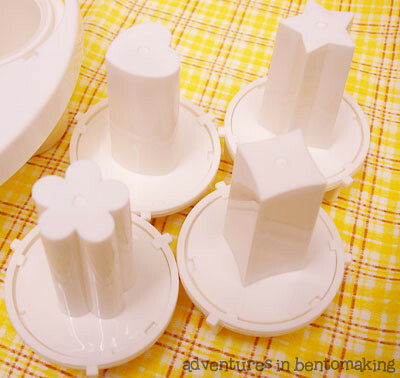 I ended up with 8 new boxes, two bags, cookie cutters, food picks, BENTO STRAPS (omg they never have those), onigiri molds, cute disposable bento boxes, and soy sauce bottles. 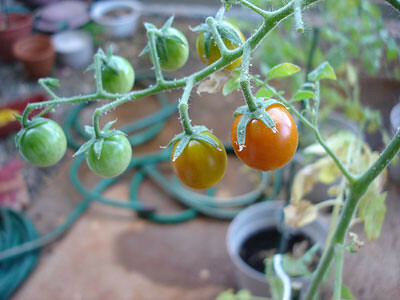 You see that red one on the right side? 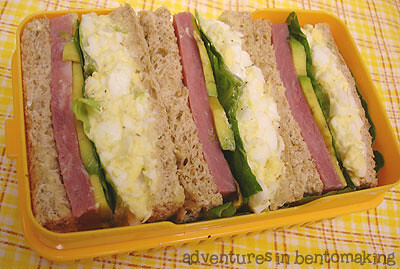 It’s obviously for a triangle musubi but I was like, WTF? Are there monster sized onigiri that I’ve never heard of or something? Then I read the package and it says it’s to store 2 convenience store musubis in. As if I’d feed my kids musubi from 7-Eleven! Ech!! 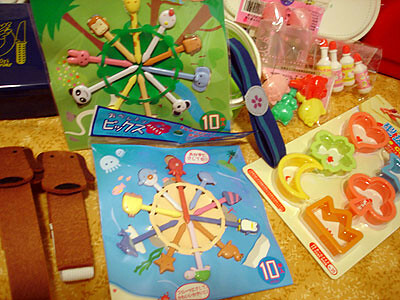 Close-up of the accessories. Aren’t those doggie straps so cute?? There were chicken ones too, but one of them clucked at me rudely and I put it back. The nerve of chickens, I swear. Finally, we get to my lunch. Whew, I sure had a lot to talk about today. I have to start writing down my topics as I think of them. 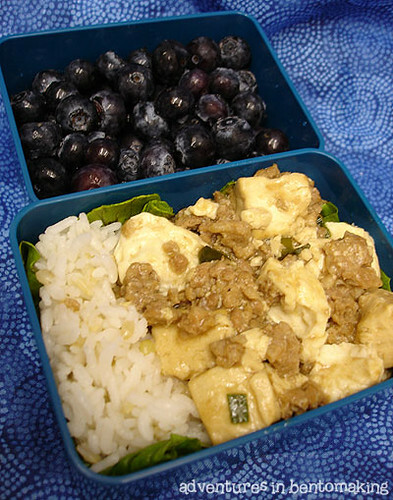 Today I had mapo tofu with rice in one of my new boxes. I love this box! 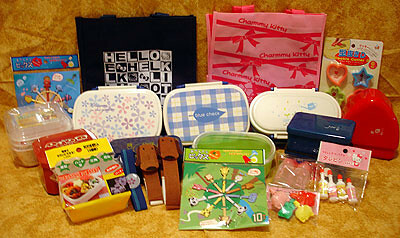 It fit a perfect amount of food for me and the blue strap I bought came in really handy. In the second tier I just dumped a lot of blueberries in cause the pack I bought at Costco was huge and decently priced, so I have a lot of berry eating to do. We recently discovered that Baby Girl and Buddy find Hawaiian music incredibly amusing. My boss gave me a spare CD of some of her favorite Hawaiian songs and with them being obsessed with Eggman’s Somewhere Over the Rainbow, they make me play it all the time now. There’s a version of No Ke Ano Ahiahi that makes them break out in fits of giggles and then yell at me to start the song again. This CD has provided many hours (yes, I said hours) of car entertainment, so Auntie B scores points with my kiddies. YOU KNOW, THERE WASN’T ALWAYS TIVO. IN MY DAY WE HAD TO USE THE REWIND BUTTON ON THE BETAMAX AND LET ME TELL YOU, IT SUCKED! Of course, I had to do some cosmetic rearranging because the corn was sprawled all over the rice and I ate a little bit of it for dinner and all and he put the cover on upside down and stacked the lower tier on top, but overall the food was very nicely packed. What a guy! Our FFXI radio show debut last night was riddled with audio issues but overall I was happy with how things went. We had a few weird silences here and there but I still got a lot of good feedback and people seemed to enjoy the show. 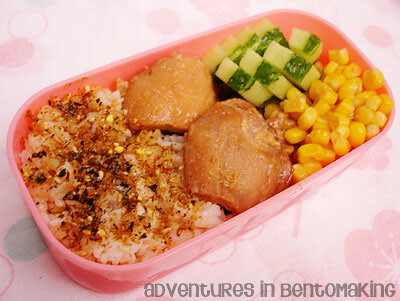 Next week I will only have one bento as I am taking Wednesday-Friday off for Fan Fest and Monday is a holiday. 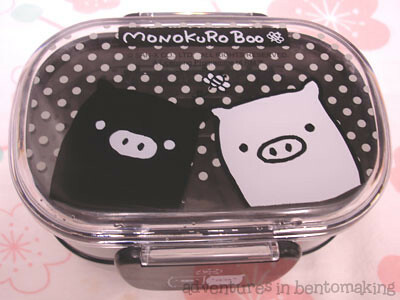 Today I’m breaking in a new box, my new Monokuro Boo box! This was one I bought a couple weeks ago but just haven’t gotten around to using. It’s a pretty small box and since I didn’t have too much food to put in it, it seemed like the time was right for its debut. 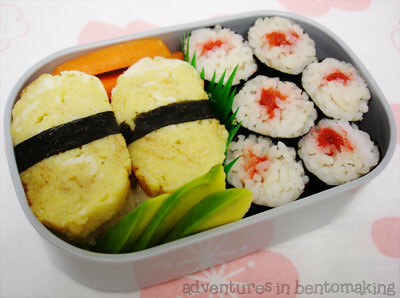 I used two slices of the tamagoyaki I made yesterday and made me some tamago sushi along with a roll of ume maki to use up the last of my leftover rice. 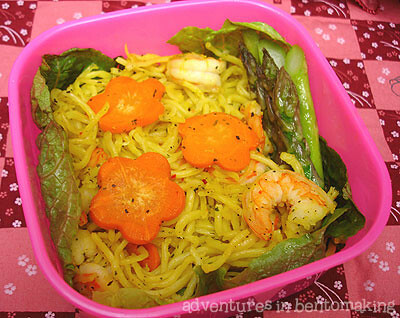 To add color I put in some sliced avocado and carrot sticks. I forgot to sharpen the image this morning before uploading so the photo is a lil bit fuzzy. 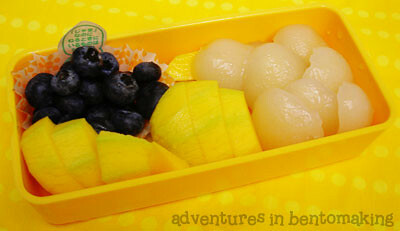 I have peeled rambutan and cigar mango in the bottom layer but didn’t think it was exciting enough to photograph. 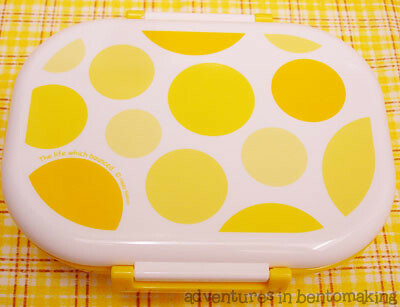 I do believe this is one of my very rare vegetarian bentos. I’ll probably end up eating some Smart Pop today to help fill the meat void. I have heard about the whole popcorn lung thing, but that doesn’t mean I’m going to stop eating popcorn altogether. What I have decided is that eating a bag 3-4 times a week probably isn’t a good idea anymore, so I’m limiting myself to one bag per week. I’ve also got to somehow get my brain back onto the points system. I’ve been having difficulties ever since I dropped down past 130 because I guess part of me feels that this is the lightest I’ve been since 1997 so I’m really still way ahead of myself. I find myself still watching my portions but I no longer pay strict attention to how many points I’m eating. Still, I’ve been bouncing between 125 and 128 for the last month, so I suppose I haven’t been all THAT naughty with my eating habits. I’m one of those market shoppers that go with a list but then grab things that look good or things that are on sale and as a result I have a freezer that requires grunting to close because it’s so full of frozen foods that I may one day use. This morning I decided to actually USE some of it and fried up one curry croquette and one veggie croquette. 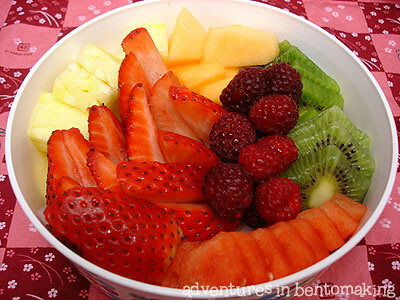 These are quite yummy and easy to make. All you do is deep fry them, I like to use a tiny little pot so that it covers the whole patty yet doesn’t use up a ton of oil. Last night I made teriyaki beef for dinner and we ate it all, but still had a lot of rice left so I was a bit generous with my rice portion this morning. I topped it with Seto Fumi furikake then put the croquettes cut in half on top of it. To add color I put some little carrot sticks and some corn. Too bad for me that this morning I started cooking dinner for tonight, not realizing that we weren’t even going to be eating at home. So now I have mochiko chicken marinating and we’re not going to eat it. What I’ll do is fry it tonight, freeze it, then defrost for the Charleston Southern game on Saturday. 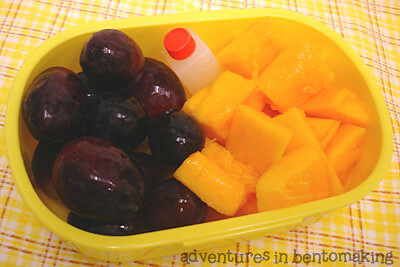 This will go along great with the plan I have for the onigiri. You’ll see what it is! I’m terribly excited to do it!! In my hasty post yesterday I forgot to mention that the UH football team won against UNLV Saturday. We’re now 3-0! It was pretty hilarious to see the big Hawaii crowd because they were mostly old Japanese people retired in Vegas. Someone even had an old Rainbows banner! If you didn’t know, Vegas is the Florida for Hawaii. That’s where people retire to.